This week in Taizé is very international. This diversity is present at every moment of our life: in common prayer with readings in many languages, for the communication in small sharing-groups or work-teams and, first and foremost, through the personal encounters that we can all have. A bit later, a child will read the list of all the countries represented, which also includes the countries, often very far away, of the many volunteers who are spending the summer in Taizé, together with those who are here for a year. Their presence is very important and I would like to express to them them tonight many thanks for their commitment. 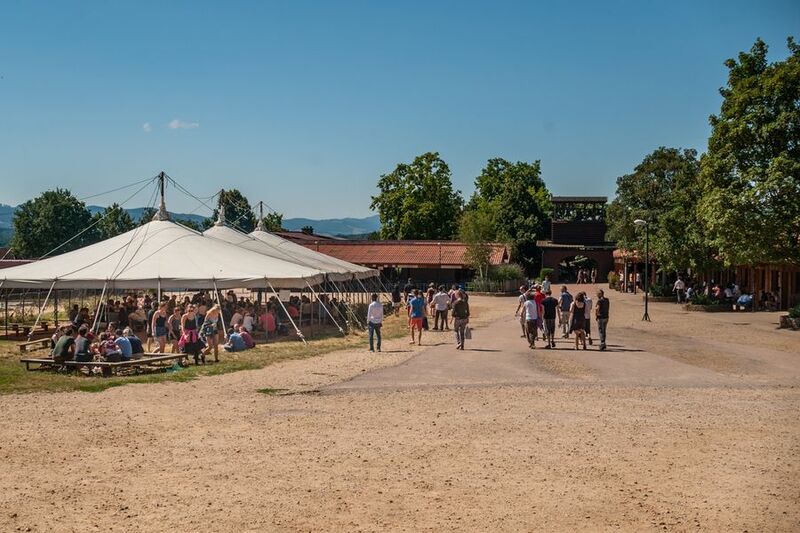 A few days ago, we had a special meeting here in Taizé: the second "weekend of friendship" between 300 young Christians and Muslims, who were able to discover each other and create many bonds of friendship. It was a sign of hope to be able to live together this experience of fraternity, while also being aware of our differences. When we are firmly rooted in our faith, there is nothing to fear from a dialogue with those who think differently ... and true friendship is even possible. That is our experience. In the world as it is, such opportunities for dialogue and friendship seem to me essential. Faced with the rise of fears and the violence that often seems to gain the upper hand, let us always make the choice of trusting in our relationships with others. Expanding our friendship! With all my heart I would like to invite you to this adventure. We must not just stay in the circle of those who are already close to us. When we go beyond borders, our life finds a fullness. All of us need a sense of belonging, to feel part of a family, a group, a country. At the same time, there is a need in us to be open to new horizons. Our identity is impoverished when we draw a circle that encloses us. So we should not be afraid to open up to new challenges in the world, including the challenge of a growing gap between rich and poor. Some kinds of poverty are quite obvious. And there are forms of poverty that are less visible. Loneliness is one of them. In our rich countries, even among those who materially lack nothing, there are some who wonder about the meaning of their lives, it is as if they do not belong anywhere, they are strangers on the earth. How can we get closer to those who suffer, listening to them and being touched by them? Around the world, there are also women, men and children who are forced to leave their countries. It is distress that creates in them a motivation to leave. That distress is stronger than all the barriers erected to stop their coming. The many people who arrive create insecurity in us; this fear is understandable. W want to resist fear, but that does not mean that it has to go away, but that it does not have to paralyze us. We must not allow the rejection of foreigners to enter our mentalities, because refusing others is the seed of barbarity. As Christians, we should remember that we are all strangers on earth ourselves. These are words of the Bible: we are strangers on the earth. We are pilgrims on this wonderful planet (see Hebrews 11:13), we have no home here forever, we are heading towards our homeland in heaven. I would now like to give the floor to a friend from Taizé, Amaya, who is here with her family, and who works in Rome at the service of the Church for the accompaniment of refugees. She will tell us a few words about her commitment. Amaya: We often hear news about refugees and migrants, but in this news there are no faces. And yet, this mosaic of children, women and men is made up of specific names and stories. Since I finished my law studies, I have worked as a refugee lawyer, trying to find a safe place for them and for their right of asylum to be recognized. In addition, with my family we have the privilege of welcoming refugees in our house regularly. We have known and loved people from Syria, Yemen, Mauritania. Thanks to them we have been able better to understand what is happening in their countries, the the reasons they have left home, the cultural richness they leave behind. Our experience is that we receive much more than we give. People who have lost everything have a lot to teach us. There remains in them a spiritual and human strength that challenges us. Yes, the refugees are our teachers. Following in the footsteps of Jesus, we should not be afraid to cross the cultural, social and religious boundaries of our time to enter into relationships with others, because through a personal encounter, we discover the treasures that each refugee carries with them. Thank you! With great enthusiasm Amaya helps us to widen our friendship. And now, Ishmael will read the names of all the countries represented these days in Taizé. Ismael: There are flowers for those from Mexico, Guatemala, El Salvador, Haiti, Dominican Republic, Nicaragua, Panama, Colombia, Brazil, Bolivia, Chile and Argentina. For those from Canada, the United States and New Zealand. For those from Romania, Slovakia, Hungary, Greece, Bosnia and Herzegovina, Croatia, Czech Republic, Austria, Slovenia, Italy, Liechtenstein, Switzerland, France, Spain and Portugal. For those from Russia, Finland, Sweden, Norway, Ukraine, Estonia, Latvia, Lithuania, Poland, Denmark, Germany, Netherlands, Belgium, Britain and Ireland. For those from Egypt, Burkina Faso, Nigeria, Chad, Sudan, Gabon, Democratic Republic of Congo, Uganda, Kenya, Zimbabwe and South Africa. For those from Japan, Korea, China, Hong Kong and Macao, Cambodia, Indonesia, East Timor, India, Maldives. For those from Iraq, Syria, Jordan, Palestine and Lebanon.